The Kwiksol Conversion direct system is used in frost-free locations where the ambient temperature never falls below 5ºC and where the water quality is good (less than 600ppm Total Dissolved Solids/Minerals). Use The Kwiksol Conversion direct system in frost-free locations where ambient temperatures never fall below 5ºC and where the water quality is good (less than 600ppm Total Dissolved Solids/Minerals). The solarfit conversion kit direct system is used in conjunction with an existing installed Kwikot domestic electric water heater. It is installed inside the roof (Split System) without an integrated heat exchanger. Circulation of water through the solar vacuum tubes from the electric water heater. Circulation of water done by a 12V solar circulating pump (pump circulating method). And a final result, transferring solar energy into the electric water heater and heating the water directly. Contact our Guru’s today for a Kwiksol Conversion! The conversion kit includes a new heating element and Kwiktherm Thermostat. The existing flange assembly behind the electric plastic cover is unscrewed from the inner storage tank of the electric water heater and replaced with a purpose made flange including water distributor pipes, new element and thermostat, called a Solarfit Direct Flange Assembly. 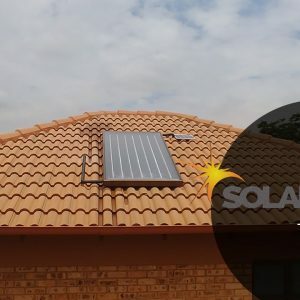 The short cold water pipe on the Solarfit Flange Assembly must face downwards into the tank and the longer, hot water pipe points upwards in the tank. The solar vacuum tubes and 12V photovoltaic solar collector are installed outside on the roof with a north facing orientation and inclined as close to 30 degrees from the horizontal as possible. A 15mm copper pipe is fitted between the solar vacuum tubes and the new Solarfit Direct Flange Assembly to allow the water to circulate between the electric water heater and the solar vacuum tubes. The 12V solar pump is installed between the solar vacuum tubes and electric water heater (cold side) to ensure positive flow. The pump is powered by a 12V photovoltaic solar collector. The solar vacuum tubes are to be installed in a parallel array and at an angle determined by the latitude of the installation. For optimum performance the solar vacuum tubes need to face the equator (facing north for southern hemisphere installations). Installation on angles of up to 45 degrees away from the equator do not have a major effect on the annual solar output, consequently roof locations which face less than 45 degrees away from the equator are acceptable. Solar radiance from the sun begins at about 10:00 until about 16:00 and is at its peak between 12:00 and 14:00. If the solar vacuum tubes are installed with an east facing bias, the best solar capture is achieved in the morning, and if the installed with west facing biased, in the afternoon. The location should not be subject to excessive shading from trees and adjacent buildings and particularly between 9:00 and 15:00. Remember that shadows are longer in winter than in summer so a location that is free of shadows in the summer may have some shadows in winter. The solar vacuum tubes should be installed on a roof pitch greater than 8 degrees and less than 30 degrees. Where the roof pitch is greater than 30 degrees, the installation will require additional support to prevent it from moving downwards when installing and after installing. If the roof pitch is less than 8 degrees the 7installation will require a mounting frame to increase the pitch to above 8 degrees. 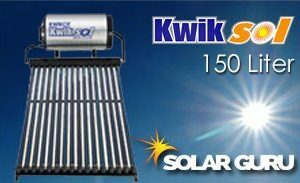 The Kwiksol Solar Vacuum Tubes consist of two glass tubes manufactured from borosilicate glass. The outer glass tube is transparent allowing light rays to pass through it with minimum reflection. The inner glass tube is coated with a solar special selective coating (Al-N/A1), which provides excellent solar radiation absorption. The top of the two vacuum tubes are fused together and the air is extracted, which forms a vacuum and is key to the efficiency of the vacuum tubes. To maintain a vacuum between the two vacuum tubes, a barium getter is used. The barium layer also provides a clear visual indication of the vacuum status. The silver coating will turn white if the vacuum is ever lost. Anodized Aluminium frame and manifold. Working pressure up to 600kPa. The warranty period on the Kwikot solarfit conversion kit (new parts) is one year from the date of installation providing that documented proof of installation is furnished. On existing parts the balance of the original warranty of the Kwikot Electric Water Heater will apply. The installation must be carried out by a Kwikot Approved Installer, failing this the warranty will become void. The warranty only applies to defects, which have arisen solely due to faulty materials and workmanship during the manufacturing process of the solar collector/s. If any component fails during the warranty period, Kwikot will replace or repair the failed component free of charge. Breakage or cracks to the evacuated tubes is not covered by the warranty. Any freeze damage caused as a result of the solar vacuum tubes not being installed as a direct system in frost areas or areas which record temperatures below 5 degrees Celsius, is not covered by the warranty. The warranty on the installation is the responsibility of the installer.